On the new VDMA website, the Photonics Forum provides information about the key technology of photonics and bundles the competence of seven photonics-related VDMA organisations. Frankfurt,Germany,04 March 2013. 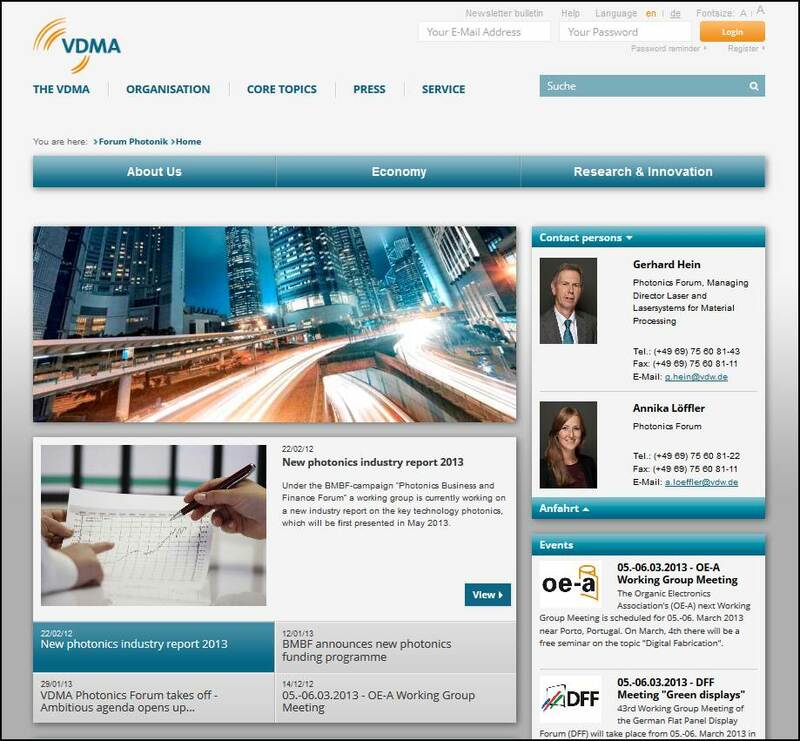 –The Photonics Forum within the German Engineering Federation (VerbandDeutscherMaschinen- und Anlagenbau – VDMA) – the theme-based affiliation of seven VDMA photonics-related professional sectors – appears in its own information platform in the new digital network of the VDMA. Modern, dynamic, theme-based: At the start of the new year, the VDMA launched a completely redesigned online presence. The internet is after all one of the most important information media today, and the first impression of an internet page is often decisive for the user. Reason enough to give the website a new look. The outcome is something to be justifiably proud of: The resulting digital network clearly structures the tremendous thematic variety of the federation and offers a virtual space for networked information and communication. With this effort, the Photonics Forum in the VDMA also aims to cast the innovative key technology more directly into the “limelight”: Its own information platform is intended to communicate more intensively about the technology field of photonics and about all of its current and future challenges and opportunities – by providing the information not only to professionals within the trade, but also in particular to the general public, policymakers and media, potential investors, and the young professional talents of tomorrow. The home page of the fully bilingual (German/English) photonics portal provides a list of the current press releases and news of the VDMA photonics professional sectors. Further upcoming meetings, workshops, conferences and trade fairs concerning each speciality segment are presented here. For a more in-depth look into the core activities of the forum, there are three subcategories: In the category “About Us”, the forum first introduces itself and the technology field of photonics along with all seven of the VDMA divisions participating in the forum. Under “Economy” the visitor finds more detailed information on an industry-wide campaign of the German Federal Ministry of Education and Research (BMBF) with the photonics trade associations – an image-boosting campaign which aims to attain growth rates and market shares on a global scale now and in the foreseeable future. The “Market Research Working Group”, jointly formed for this purpose and reinforced by means of external consulting, is currently compiling a new photonics industry study: The results of the initial work packages will be presented for the first time in May of this year. The third category is the topic of “Research & Innovation”: It provides information about “Photonics Campus Germany”, a similarly industry-wide BMBF-supported campaign with the relevant associations and the industry as a whole to promote young talent. The latest news items from the European Technology Platform Photonics21 are also discussed in this category along with new BMBF funding announcements and project tenders in the area of photonics. The Photonics Forum bundles and networks the existing competences and resources in the VDMA on a thematically oriented platform. The list of actors in the forum includes the following VDMA organisations: the German Flat Display Forum (DeutschesFlachdisplayforum – DFF), the Industrial Image Processing Sector “Machine Vision” (FachabteilungIndustrielleBildverarbeitung), the Working Group Laser and Laser Systems for Material Processing (Arbeitsgemeinschaft Laser und Lasersystemefür die Materialbearbeitung), the Micro Technologies and Components Association (FachverbandMikrotechniken und -komponenten), the Organic Electronics Association (ArbeitsgemeinschaftOrganischeElektronik – OE-A), the Working Group Photovoltaic Equipment (ArbeitsgemeinschaftPhotovoltaik-Produktionsmittel) and the Productronics [Electronic Production] Association (FachverbandProductronic).The network of the forum includes more than 500 companies and research institutions along the entire value creation chain – about 400 of those members are mainly active in the field of photonics.